KMT (koleinyi minnyi tral, rut mine sweep) family of mine rollers/plows is an optional equipment designed for producing rut passages in the AT mine fields. 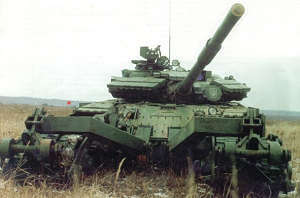 The sweeps are attached to the front of Russian MBTs. In general, one mine sweep is issued per a tank platoon. The models that are currently in use are KMT-6 and KMT-7, the new KMT-8 model is also being fielded. KMT-7 mine sweep is of a combined roller/plow type. The full set of equipment comprises two roller sections, two plow sections, two mounting frames, coupling device, pyrosignals cassette for passage marking, electrical equipment, pneumatic system, and a repair kit. The passage in the minefield is created as a result of pressure applied to mine detonators by the roller sections, followed by the unearthing of undetonated mines and their pushing off the path by the plow. 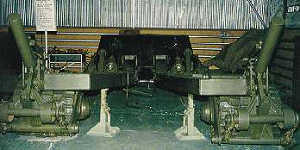 In addition, two flexible torsions are installed on the mounting frames to counter antennae-activated bottom-piercing mines. Finally the detonation of magnetically triggered mines is achieved by an additional electro-magnetic attachment. This page is © 2000, Sauron's Creations.